Water may be the stuff of life, but it can also be a place of death. For the ancients, the sea was full of dangers, and thus was greatly feared. It was a dark and chaotic wasteland. It is no wonder then that when John the Revelator envisioned the new heaven and the new earth, the sea was no more. We may enjoy the beauty of the ocean, but in this vision it is the enemy to be defeated or controlled (Rev. 21:1). Of course, Revelation also envisions a river of life, flowing from the throne of God, bringing sustenance to the people of God. And for Paul, water becomes the grave into which the sinner is buried, so that they might be resurrected to new life (Rom. 6). 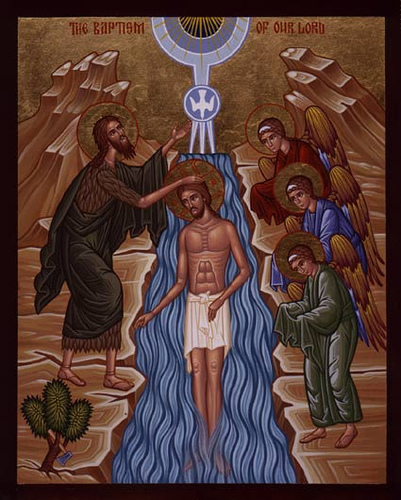 On this First Sunday after Epiphany we celebrate the baptism of Jesus, an event that marked the beginning of his ministry, the giving and the confirmation of a call, and the endowment with the Holy Spirit. Water makes itself known on this day, and it marks our lives as we hear the word of God for us today. But water is not the only image present – there is also the image of light, which shines in the darkness. And so we continue our journey into a new year, having been marked by our engagement with water and with light. It is through God’s ruach that God transforms uninhabitable space-time into benevolent, life-giving order. (Rachel Timoner, Breath of Life, pp. 4-5). Chaos is, in this passage, an uninhabitable zone, that must be ordered if life is to emerge. This is, according to Genesis, the work of the Spirit. But even as the Spirit brings order out of this watery chaos, God turns on the lights, so that a boundary can be created in the darkness, so that darkness can no longer hold sway over the world. And when God sees the light, the light that allows the creation to burst forth with life, God declares that this is good. Indeed, we can say, without hesitation, that the creation is good, for God has pronounced this to be so. Mark’s gospel lacks an infancy story – that is, there’s no Christmas here. This gospel cuts to the quick, and so we find ourselves on the edge of the Jordan. Standing before us is the rather ascetic preacher John the Baptizer. He’s dressed in camel hair clothes and lives on the locusts and honey he finds present in the neighborhood – this really is local food. His message draws a crowd. For some reason the people of Judea and Jerusalem feel the need to go to the river and declare their sins and have them washed away in the waters of baptism. Now, this isn’t the river that flows by the throne of God, at which the saints gather. No, this is the Jordan and those who gather, they are sinners, amongst whom we might number ourselves. As John baptizes the sinners who gather at the river, he declares that his ministry is one of preparation. It is his calling to point to the one who is coming, the one who is stronger than he, whose sandals he’s not worthy of bending down and tying. 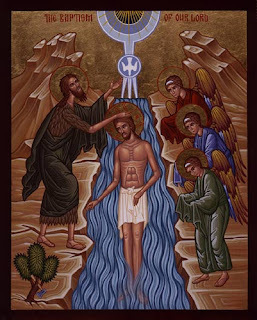 While John baptizes with water as a sign of repentance, this coming baptizer will baptize with the Holy Spirit, the same Spirit that brought order to the waters of chaos. As he makes this declaration about the coming one, a man comes to the river seeking baptism; his name is Jesus from Nazareth in Galilee. Unlike the other accounts, Mark doesn’t portray John and Jesus debating as to whether Jesus needs to be baptized. We don’t find John suggesting that Jesus baptize him. In this account, Jesus comes to the river as one of the sinners, seeking baptism along with the others. He is, therefore, one among the sinners, but then, as Jesus emerges from the waters of baptism, which are a sign of repentance, the grave in which sin is buried, we see the heavens open – or at least Jesus sees the heavens open – and he sees a dove descend, the sign of the Holy Spirit, and he hears a voice coming the heavens: “You are my Son; whom I dearly love; in you I find happiness.” Does anyone else hear this witness? Mark doesn’t say. But Jesus understands his calling. From that day on, whether he knew it before or not, his mission in life was God’s mission for the world. But before he could begin that mission, he would be driven into the wilderness by the Spirit, where he would be tested by Satan. 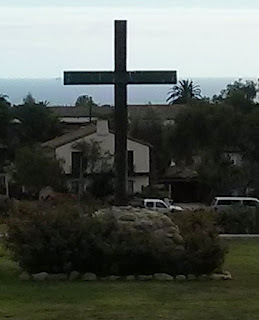 Now that’s not part of the story of the day, but let us not forget that the story of Jesus involves the cross and does not jump from one glory to the next. The question for us concerns – how does our baptism change us? Do we also hear a call from God in baptism? In this set of readings the lectionary moves away from the Letters to Acts, and in this passage, we find ourselves in Ephesus with Paul. Luke tells us that Apollos is in Corinth, which apparently allows Paul to leave behind his pastoral duties in Corinth so he could restart his missionary journey. Upon landing in Ephesus, one of the great cities of the Roman Empire, Paul encounters “disciples,” but disciples of whom? At first he assumes they are followers of Jesus, but he quickly discerns that this may not be true. He asks them about the Holy Spirit – when had they received the Spirit. When they answer – we don’t know anything about the Holy Spirit, Paul begins to realize that something is amiss. So he asks – what baptism did you receive when you believed? The answer – John’s. Yes, they are followers of the one who points to Jesus, rather than to Jesus himself. This reality triggers in my mind the distinction that Karl Barth makes between the Word of God, who is the Christ, and the Word of God that serves as the witness to the Incarnation (the Bible). How often do we become followers of the witness, rather than the one to whom the Bible bears witness? These disciples of the one who bore witness to the Christ, the one who spoke of the Holy Spirit, now need to be enlightened as to the identity of the one John bore witness. Upon discerning this reality, Paul explains the gospel to them, and they respond by allowing Paul to baptize them (presumably in water) in the name of Jesus (note here that there isn’t a Trinitarian formula, suggesting perhaps that such a formula isn’t a necessity, despite certain ecumenical statements). Baptism in the name of Jesus is sufficient. Well, perhaps not completely sufficient because Paul lays his hands on these new disciples, and at this moment the Spirit comes and they begin to speak in languages (tongues) and prophesy. All told, there were a dozen of these disciples present. This separation of baptism and receiving of the Spirit has, of course, given support for the practice of Confirmation, but that is really a reading out of the passage, not something is inherent to the passage. The point though, is that this group of disciples of John, become disciples of Jesus. Their chaos is, therefore, ordered! Water can be chaotic, but it can also be the means of life. Following the lead of Jesus, we are baptized and with baptism, it would seem, comes the enlivening presence of God’s Spirit – God’s breath and God’s wind. May we be enlivened by the Spirit who comes to us through Christ. So the work of "creation" is not so much concerned with manufacturing 'something' where 'nothing' exists, so much as to bring order and harmony out of chaos? And not just any sort of order or harmonization, but an ordering and harmonization which are in conformity with the will of God, which we can affirm by the divine pronouncement that it is "good". For humans, who God ordered out of the dust and into God's image and likeness, and who seek to imitate the divine creative impulse, that impulse should direct us to likewise seek ways to work towards order and harmony, in ways consistent with the will of God. All of which begs the question: what is the nature of the harmonization which God wills for humanity? For the Christian, that vision of order is discerned in the life, teachings, death and resurrection of Jesus. Blessed is the Peace Maker, the one who seeks to bring harmony.